Äîêòîð Erik Niville â 1998 ãîäó ïðåäëîæèâøèé òåõíèêó âûïîëíåíèÿ ëàïàðîñêîïè÷åñêîé îïåðàöèè áàíäàæèðîâàíèÿ æåëóäêà ïîä íàçâàíèåì "pars flaccida technique" ïðåäëàãàåò ê âñåîáùåìó îáîçðåíèþ ðåçóëüàòû óñòàíîâêè æåëóäî÷íûõ áàíäàæåé 142-óì ïàöèåíòàì â òå÷åíèè 2-õ ëåò. 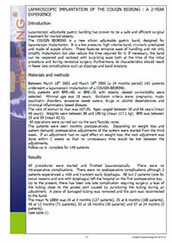 Laparoscopic adjustable gastric banding has proven to be a safe and efficient surgical treatment for morbid obesity. The COUSIN BIORING is a new silicon adjustable gastric band, designed for laparoscopic implantation. It is a low pressure, high volume band, circularly preshaped and made of supple silicon. These features enhance ease of handling and not only simplify implantation but also reduce the time required for it. If necessary, the band can be reopened and reclosed with surprising ease both at the time of the initial procedure and during revisional surgery. Furthermore, its characteristics should result in fewer late complications such as slippings and band erosions. Between March 18th 2003 and March 18th 2005 (a 24 months period) 142 patients underwent a laparoscopic implantation of a COUSIN BIORING. Only patients with BMI>40, or BMI>35 with obesity related co-morbidity were selected. Minimal age was 18 years. Exclusion criteria were: pregnancy, major psychiatric disorders, excessive sweet eaters, drugs or alcohol dependencies and chronical inflammatory bowel disease. The ratio of woman to man was 107:35. Ages ranged between 18 and 66 years (mean 40 years). Weights were between 88 and 190 kg (mean 117.1 kg). BMI was between 35 and 59 (mean 42.5). All operations were carried out via the pars flaccida route. The patients were seen monthly postoperatively. Depending on weight loss and patient demand, postoperative adjustments of the system were started from the third week. If an adjustment had no rapid effect on weight loss, the next adjustment was done within 2 weeks so that no unnecessary time would be lost between the adjustments. Follow-up is complete for 140 patients. All procedures were started and finished laparoscopically. There were no intraoperative complications. There were no postoperative complications although 2 patients experienced a mild and transient early dysphagia. All but 2 patients (one for social reasons and one with dysphagia) left the hospital on the first postoperative day. Up to the present, there has been one late complication requiring surgery: a leak of the tubing close to the access port caused by puncturing the tubing during an adjustment. A piece of damaged tubing was removed and the port was reconnected to the band. The mean % LEBW was 24 at 3 months (127 patients), 35 at 6 months (108 patients), 48 at 12 months (71 patients), 53 at 18 months (30 patients) and 57 at 24 months (3 patients). (see table 1). Mean patient satisfaction was excellent. In the group of patients, whose follow-up was at least six months, the quality of life (QOL) improvement was measured using the Moorehead- Ardelt Quality of Life Questionnaire Scoring (1). The results of these tests at 6 (106 of the 108 patients), 12 (all 71 patients) and18 (all 30 patients) months postoperation are shown in table 2. There is a considerable improvement of QOL and a clear trend from “improved” towards “greatly improved” with time. There were no intraoperative nor postoperative complications. (incise or remove some pericardial fatty pad). Thus far, no device-related late complications have been noted. Weight loss is comparable to that reported in better series with other bands.